One of my friends in the U.S. keeps bees for his small orchard. His grandfather was a beekeeper nearly his entire adult life since 1965 and so my friend has seen the good days of beekeeping and now is experiencing the bad days. This past winter, he lost two healthy hives. This spring, we opened the hives and found all the bees there, but all dead. He's done research as to what may have happened to them but some of the pieces just don't fit together. What's happening to our bee population, our primary crop pollinators, is shocking and disturbing. I understand from talking with him that almost a third of managed U.S. honey bees died last winter, according to a new survey of commercial and home beekeepers. That's more than triple the losses of 5 to 10 percent that used to be normal for beekeepers before 2005 — and double the 15 percent that beekeepers say is acceptable for their businesses to continue unharmed. The finding marks a disturbing trend among honey bees: each winter since 2006, the Bee Informed Partnership has documented losses of 21.9 to 36 percent of U.S. hives. The large-scale die offs — attributed in part to a phenomenon known as Colony Collapse Disorder — have gained widespread attention in the recent months. That's partly because if the deaths continue, they could have a major impact on the nation's food system. The U.N. Food and Agriculture Organization estimates that 71 percent of the world's most widely-consumed crops are pollinated by bees — and these crops are worth at least $207 billion. But this year, bee losses caused farmers to come extremely close to a pollination crisis, leading to warnings about impending food insecurity. But what is "Colony Collapse Disorder"? The malady is almost certainly due to combination of factors — including the Varroa mite, a single-celled parasite known as Nosema, several varieties of viruses, and pesticides. 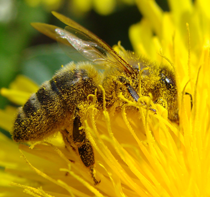 Researchers point to one particular class of pesticides, known as neonicotinoids, as a prime suspect.